Since her first exhibition in 1994, Walker has explored America's history of slavery, racism, and political and sexual violence with a visual vocabulary that includes film, drawings and mixed media. But perhaps she is most identified with her cut-paper silhouettes. 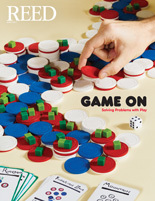 Born in Stockton, California, she grew up in Atlanta, Georgia, and received her MFA from the Rhode Island School of Design in 1994. Three years later she received the John D. and Catherine T. MacArthur Foundation Achievement Award, unleashing a flurry of criticism. Some older African-American artists charged that the work reinforced negative stereotypes and pandered to the amusement and investment of the white art establishment. This exhibition features more than two-dozen works from the collection of Portland businessman Jordan Schnitzer, including silhouettes silk-screened onto reproductions of Civil War images from Harper's magazine. The centerpiece of the exhibition is a 17-minute film, Fall Frum Grace, Miss Pipi's Blue Tale, that Walker completed in 2011. "We're all familiar with her very iconic, silent and penetrating silhouettes," Snyder says. "I wanted to focus on an exhibition that animated them and shows how she brings them into a more physical, narrative space." 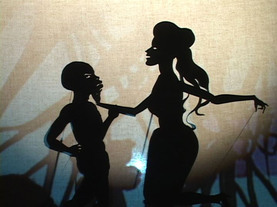 Drawing on the traditions of minstrelsy and vaudeville, the film uses shadow puppets to tell a tale of miscegenation in the antebellum South. In keeping with such traditions as commedia dell'arte and Punch and Judy, the puppetry is raunchy. Our enduring fascination with the antebellum era has been fed by manufactured images from such films as Gone With the Wind, Snyder says, which Walker clearly references. "In the opening credits of Gone With the Wind there's a scrolling text that says 'There once was an age of chivalry and beauty, a dream that is now gone,' followed by a scene of black slaves in tattered rags hoeing a field. And that says it all. We're still coming to terms with how we can be so blind about inhumanity and how, particularly in this culture, we have a way of aestheticizing it, ignoring it by consuming it." Kris Cohen (art and humanities 2011-) organized Walker's forthcoming visit on behalf of the Stephen E. Ostrow Distinguished Visitor in the Arts. The program brings to campus people whose visual arts provide a forum for conceptual exploration, challenge and discovery. Writing in the exhibition catalog, Cohen says that Walker's work provokes questions about whether by re-circulating difficult images of debased genres and gross racial stereotypes she perpetuates something old and ugly, or re-animates history — opening avenues to reparative good. Acknowledging that the work is demanding, queasy, and dispossessing, he asks: "Even if one leaves feeling that one likes the work, what exactly is being endorsed or enjoyed?" Detractors of Walker's work, he argues, have tended to see it as representational rather than durational, an image more than a performance. Though Walker's powerful images can inflict pain on viewers, they cause us to reflect on the relation of Miss Pipi's world to ours.